Following the Savings and Loan crisis of the 1980s and 1990s, my mother was glad she had stashed her and my father’s money in World Savings Bank, operated by fellow East Bay suburbanites Herb and Marion Sandler. Ever since the Sandlers started their Oakland-based Golden West Financial in 1963, which they grew into 285 branches under the name World Savings, the Sandlers were hailed for their careful, conservative lending. World Savings was voted the nation’s most admired mortgage services company three times by Fortune magazine in 2003, 2005, and, finally, in 2006. It was in 2006, just before the housing crash, that the Sandlers sold their bank to Wachovia and earned $2.3 billion for themselves. 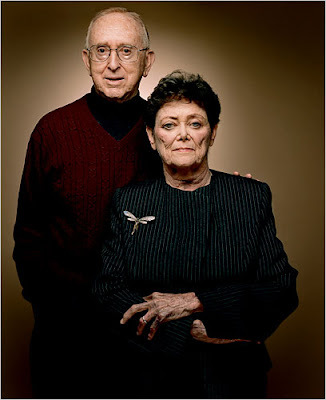 The Sandlers, who at one point lived in the Lafayette/Moraga area, got out of the banking business, they said, in part so that they could focus on directing their fortune to progressive causes, sometimes in association with Democrat philanthropist George Soros. In November 2007, the Sandler family foundation put $10 million into establishing ProPublica with Herb Sandler serving as ProPublica's board chairman. On the face of it, Pro Publica is an extremeley worthy foundation, and there's a part of me that has job envy over those who get to work there. ProPublica describes itself as "an independent, non-profit newsroom that produces investigative journalism in the public interest. Our work focuses exclusively on truly important stories, stories with 'moral force." ProPublica is trying to perform the sort of investigative journalism that was a regular feature of reputable news organizations, but whose budgets for such projects have been slashed in the current dismal news climate. ProPublica has also carried out projects in conjunction with news organizations, such as 60 Minutes. Now the Sandlers are being vilified and profiled by established news organizations, including, ironically, 60 Minutes, as possibly ruthless home lenders who helped destroy Wachovia and lead our nation into financial ruin. The main engine of their alleged ruthlessness? Being the first bank in the country, back in the 1980s, to sell the tricky ARM home loan option. The criticism of the Sandlers has been mounting for months. The U.S. Attorney’s Office in San Francisco announced dual inquires into whether World Savings engaged in predatory lending practices or misled investors about its financial well-being. This criticism culminated recently with a 60 Minutes probe, which aired last Sunday, and Time magazine naming the Sandlers to its list of 25 individuals to blame for the recession. Time magazine says: “the Sandlers’ World Savings pushed adjustable rate mortgage options with increasing zeal and misleading advertisements over two decades . … Losses on World Savings’ loan portfolio led to the implosion of Wachovia which was sold under duress late last year to Wells Fargo. The Sandlers reportedly now live in San Francisco where their family foundation is based. The Sandlers have fought back against the criticism, notably in an October 5 interview with the Associated Press. Herb Sandler, 77, told the AP: “We are being treated unfairly.” The only thing upon which he agrees with his critics is that he and Marion, who were the company's co-chief executives for more than 40 years, “couldn't have picked a better time to sell the company” when they sold their bank to Wachovia in October 2006, the AP reported. Sandler said that World's pick-a-pay loans “were made under the same qualifying standards that had been in effect during the previous 25 years when the savings and loan's losses were among the lowest in the industry and the Sandlers were consistently praised for their prudence. I don't usually post comments about looks, but the woman's hands in the photo look very odd. Not a good photo. Yeah, her hand is pretty scary in this photo. It's too bad if the Sandlers had a role in our economic troubles. I admire their causes, but it bothers me that they possibly took advantage of people less fortunate than themselves. And how fair can their investigative reporting foundation be? Is it investigating their loan practices while at World Savings? I think Slate.com has raised this question. Also, it's disappointing but I think they were big Obama contributors. It's possible that they are as bad as some of the top (allegedly criminal) Wall Street bankers. At the end of the day it's about personal responsibility. I know that greed takes over, but to actually think that you can buy a home with no money down, with in many cases no stated income... come on! Everyone saw how fast and how much home prices were going up so everyone wanted a piece of the action. Like my late grandfather used to say, "there ain't any free lunches son." Unrelated to this article, but taking from what Barry said above. "There aint no free lunches, son." Well, actually there are when most of the people who bought houses with no investment zero down, will just walk away. Nothing really to lose. In 2 years, after bankruptcy and all, they will just turn around an buy another property. Sometimes living in the currently foreclosed house and saving money for future down payments. I've personally watched it happen. I wish there was a law in place that prevented future home ownership, at least for 5 years to those that foreclose in this day and age. They would not have sold unless there was a willing buyer. I am sure Wachovia, in all of its greed, couldn't believe what a bargain they were getting.